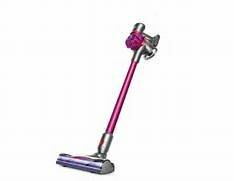 The Dyson V7 Motorhead vacuum offers 75% more power to the brush bar than the Dyson V6 Cordless vacuum. V7 Motorhead's direct-drive cleaner head is engineered for all floor types, driving its bristles into the carpet to remove ground-in dirt. Quickly transform your V7 Motorhead to a handheld for quick clean ups, spot cleaning or cleaning difficult places. The V7 Motorhead cleans hard floors with extra power for carpets & two additional tools: quick release combination tool and quick release crevice tool. Your Motorhead features 2 Tier Radial Cyclones including: 15 cyclones, arranged across two tiers, working in parallel to increase airflow and capture fine dust. You get up to 30 minutes of powerful fade-free suction. The trigger releases instantly & battery power is only used for cleaning. Dyson's hygienic dirt ejector empties dust from the bin in a single action, ensuring that you do not have to get your hands dirty. You also get extra features like Max Modewith up to 6 minutes of increased suction for more difficult tasks, a machine balanced for cleaning from the floor up to hard-to-reach high places, a docking station that stores/charges the machine & holds additional attachments, and two Dyson-engineering tools for cleaning difficult places around the home and in the car.